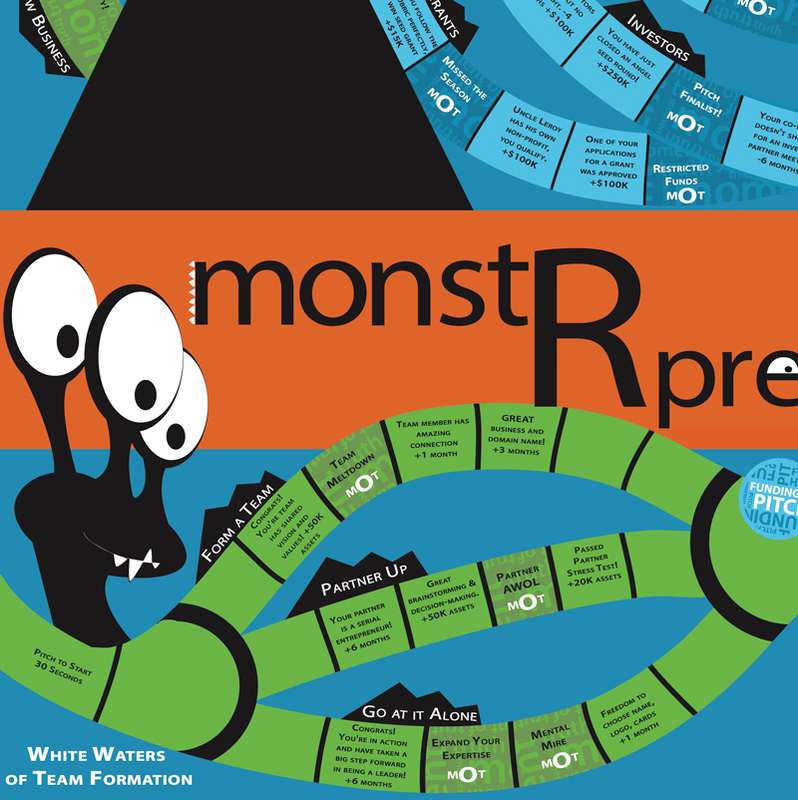 Play the MonstRpreneur Board Game to find out! 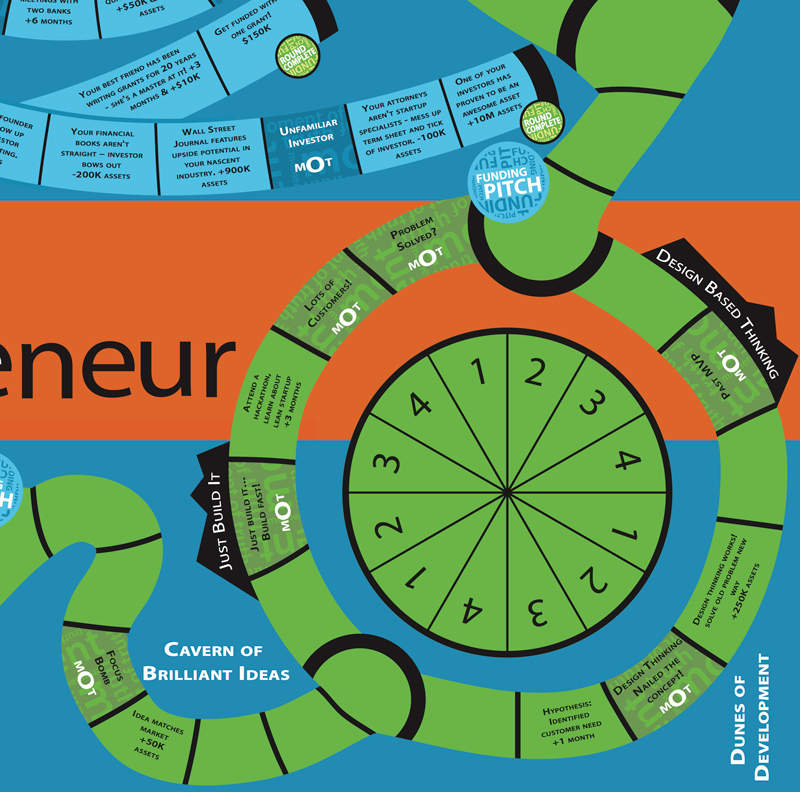 The MonstRpreneur Startup Board Game captures the adventures, challenges, choices, and wins of entrepreneurship in a board game. You have fun maximizing the value of your startup while minimizing the time it takes. You pitch, you go for funding, you have some wins, do some growth hacking, use your MonstR superpower, get some help from your online friends to win some competitions along the way to add a million here and there to your assets, and best of all you’ll have a fabulous time building your startup. 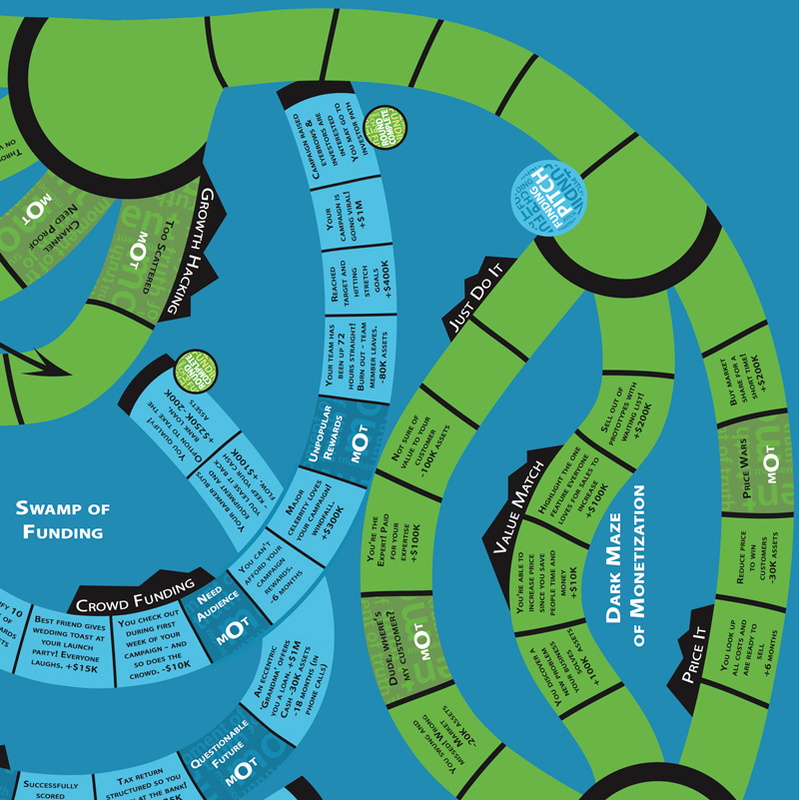 The MonstRpreneur Startup Board Game offers a little taste of what Steve Blank means by customer development and Eric Ries by the lean startup… And agile development… And growth hacking… And where the business plan comes into play… You may even move faster on your startup path after playing the game. This is a game to play over and over – why? 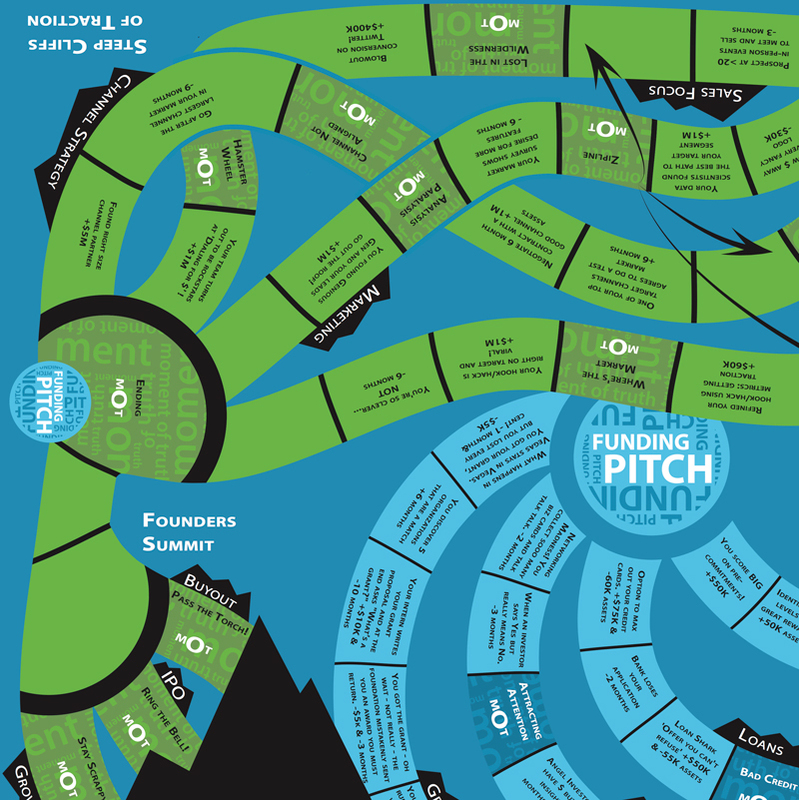 Because you can try out different strategies each time you play to see which ones lead to startup success. You can try different paths to increase your valuation. You can make mistakes and see what happens – that’s where the fun and magic of this game really happens! You can breeze through the Cavern of Brilliant Ideas and zoom over the Dunes of Development to face the Steep Cliffs of Traction – and try out different tactics to see what works on those cliffs and what doesn’t. Why go to workshops when you can play a game? Most importantly, you can get some useful insights into the leading edge thinking and tools about how to successfully build YOUR startup! Why read a bunch of books and go through a boatload of online and in person workshops when you can play a game??? The game begins at the bottom right – roll or spin to see who goes first. The first player picks their character and the company they will build. Each additional player chooses in sequence. Then, everyone starts the game with a 30 second pitch of what their company is, how it’s cool, and what difference it will make for people. After each player completes their pitch – yep, just each pitching – then the first player rolls or spins and advances. And so it goes. You can play the standard version OR a rapid 1/2 hour version – both are fun. The rapid version is great to teams to play together or as an icebreaker for a meetup. You are driven by turning dreams into reality. Your Reality Distortion Field can convince all those in your path of the worth of your idea. You can be counted on to turn skeptics into champions. You embody charisma and leadership. You can be counted on to spark the passion in others and create action. You are a master pragmatist. You can be counted on to create something out of nothing in a clever yet simple way. You are an idea person, a keen observer and a perpetual experimenter. You can be counted on to see the statue of David inside the block of marble. You are an inspired opportunist. You see how to best fit together the potential and skills of everyone. You can be counted on to create the optimum team combination. You love meeting new people and are an expert at making introductions. You can be counted on to know everyone in the room and what they do faster than anyone else. Genius at translating designs and intentions into fully built reality; can build great experiences for your customers that solve problems in person or online at heart of business. You are enthusiastic and focused – always looking for ways to increase revenues. You can be counted upon to always find a way to make another buck. You are clever, classy, and clairvoyant. You see inside the mind of your target customer. You can be counted on to create raving fans for any business you touch. You sell anything to anyone. You are smooth, thoughtful, and quick to take action. You can be counted on to sell ice cubes to Eskimos.